towards the narrows between the east and west ends of the lake. 2. Redpolls seen in flock of about 20 feeding on seeds from thistles along Sturgeon shore beside platform. 3. Ducks forming a 'raft' of about 50+ birds in centre of Riel Pond … difficult to make out the species. 4. Harrier seen flying near the platform. Bird feathers (perhaps a coot) on the platform probably a kill. 5. Gulls seen with ducks and sitting in a few other locations (near kayak club buildings) on Riel Pond. 6. 99.9 percent of the lake covered in ice as with Riel Pond. 100 percent of river covered. 1. Thousands of birds are present on Big Lake but the fall plumage of the ducks makes it difficult for identification at a distance. 2. Only three white pelicans could be spotted far across the lake. The light is perfect in the early morning to view birds at a distance. 1. Hundreds of birds on Riel Pond are present but the fall plumage of the ducks makes it difficult for identification. 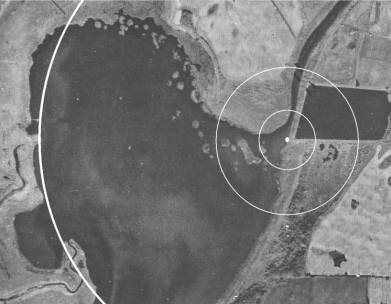 thousands of birds could be spotted with binoculars and a scope in Zone #3. 3. Only 11 pelicans were spotted. 1. 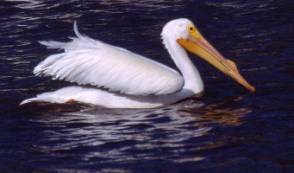 Approximately 125 white pelicans were spotted throughout the east end of the lake feeding heavily on plant material. 2. 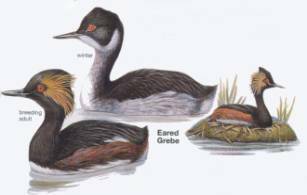 An eared grebe continues to stay close to the platform with a couple of chicks. 3. Huge numbers of Franklin's gulls spending time in Riel Pond and on the adjacent soccer fields. A Feature Bird to look for from the viewing platform currently is the White Pelican. 1. A number of species have young at this time: Blue-winged teal, widgeon, bufflehead, goldeneye, coots. 2. An albino goldeneye is still on Riel Pond feeding with its siblings (now 2/3 adult size). 3. The near absence of redwing blackbirds is in stark contrast to a month ago.